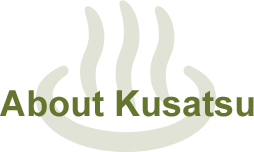 Kusatsu Onsen in Gunma Prefecture is one of Japan's most famous hot spring resorts. The springs boast the highest natural spring water output in Japan pumping out 32,300 litres of water per minute, which is enough to fill around 230,000 barrels a day. 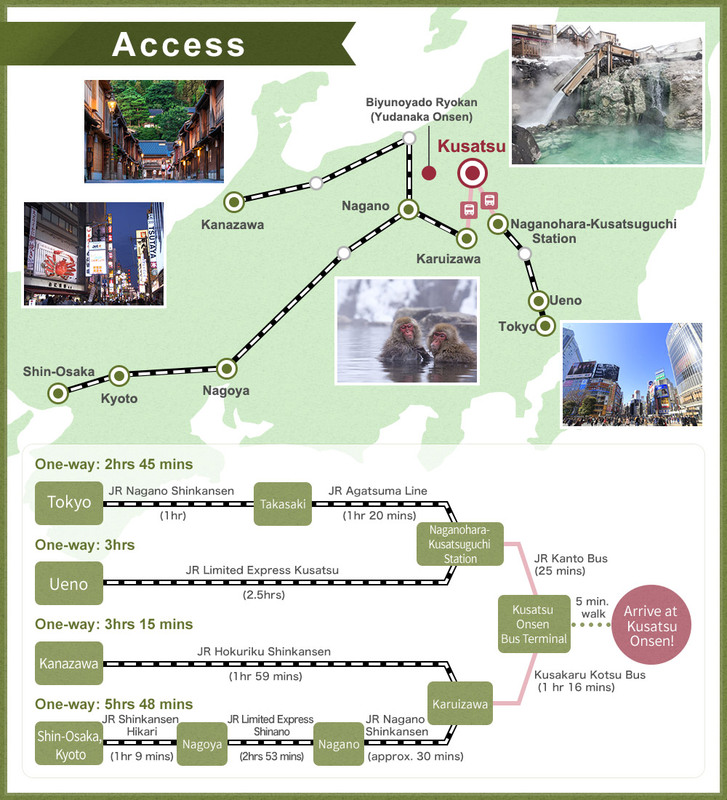 Kusatsu is a hot spring paradise with over 100 hot spring sources (including 6 main sources) feeding the numerous ryokans and the 19 free public bathhouses. 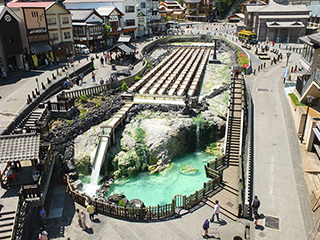 The 'Yubatake' (hot water field) is the symbol of Kusatsu located in the center of town, and this all-season tourist spot attracts crowds for its cooler weather in the summer and skiing in the winter. 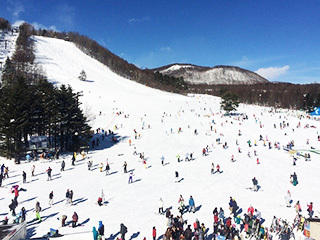 There are many things to do that are unique to Kusatsu, while the resort town of Karuizawa is within easy access too. 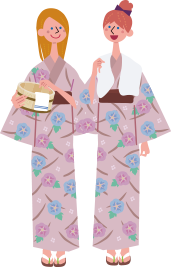 Have fun in the hot springs, trying local food, sightseeing and shopping! Why not have a snack as you walk around and dip your feet in the many free footbaths around the Yubatake! A 10 min. walk from Yubatake. 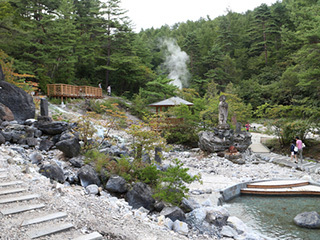 Wander through the park and see hot spring water bubbling to the surface from everywhere! 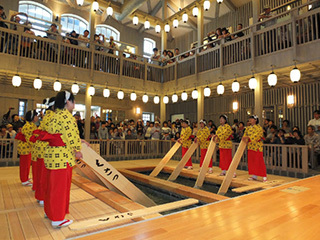 Yumomi is the traditional method of cooling the water using wooden paddles as the performers incorporate chants and songs. A 5 min. bus journey from town. A ski resort open until April so guests can take advantage of the long season. 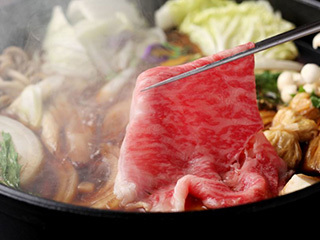 Gunma Prefecture's signature beef. We offer lots of accommodation plans where you can enjoy this special treat! 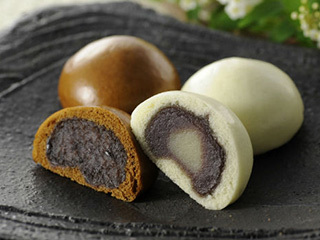 Each shop make their manju (soft buns filled with red bean paste) differently. Try a variety and take your favorites home as souvenirs.